We are informing you that due to numerous appeals wishing to participate in the Promotion from TaxFree4U, we have decided to extend it until January 31, 2019. Hurry up and you take part in the draw of iPhone X 64GB from TaxFree4U. Customers of our partners can win the iPhone X 64GB. Of all the participants who fulfill the conditions of the Promotion, we will choose the winner using the random.org random number service! 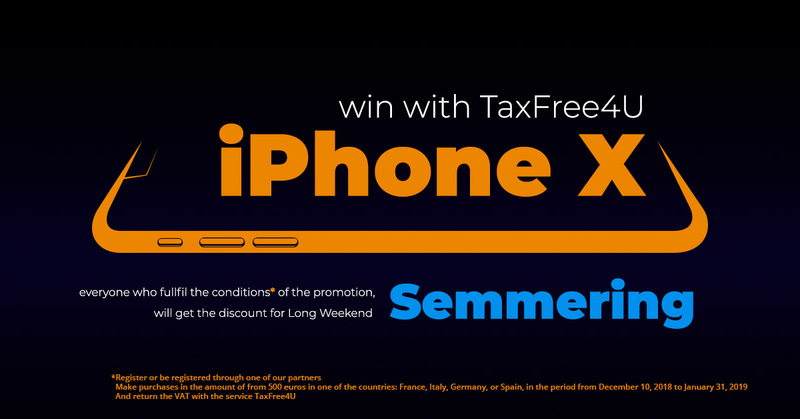 Also, everyone who fulfills the conditions of the Promotion receives a discount from TaxFree4U at LongWeekend in Semmering. Who can participate in the promotion? – Clients of our partners who used the TaxFree4U mobile application. How to participate in the action? – Register or be registered through one of our partners. – Make purchases in the amount of 500 euros in one of the countries: France, Italy, Germany or Spain, in the period from 10/12/2018 to 01/31/2019. – And return the VAT with the service TaxFree4U.